If the coming of The Beatles and the Merseybeat Boom can lay claim to influencing countless teenage boys to pick up a guitar, then the same could be said for The Shadows just a few years earlier. It was Cliff’s backing group that set Birmingham born Rick Price off on his musical career after being bought a guitar by his parents. The Cimarrons was Rick Price’s first group, five lads from Birmingham whose lead singer Ray Hyde adopted the stage name Lee Zenith, a name surely worthy of invention by fifties and sixties impresario Larry Parnes. It was with The Cimarrons that Rick has his first taste of recording, though to be fair it was a fairly amateurish event, one of a number of groups hurriedly collected together to record a song each on a ‘Brum Beat’ LP for a one-shot label called Dial. If the producers thought this was going to show Birmingham in a light that would compete with Liverpool, they were sadly mistaken. The Cimarrons suddenly had a bad patch with constant personnel changes, so Rick made a move and joined The Sombreros who were soon known under another name, Sight And Sound. Managed by local promoter Mike Carroll, Sight And Sound were one of many Midlands groups that could play anything between twenty-five and thirty gigs a month, such was the vibrancy of the scene from Coventry in the South to Wolverhampton in the North. With harmonies to the fore and a slight psychedelic sound, Sight And Sound had two records released on Fontana in 1968, with three of the four songs being written by Rick and fellow group member Mike Sheridan. The following year he got an even bigger ‘break’. The Move were down to three members, Roy Wood, Carl Wayne and Bev Bevan – they needed a bass player and Rick was their chosen man. He joined just as “Blackberry Way” was heading up the charts – by early 1969 it was number one, but friction was growing between Roy Wood and Carl Wayne; Wayne was happy doing cabaret gigs, Wood wasn’t and so the group started to fracture and soon The Move would give way to E.L.O. It was at this point, and managed by former CBS Records salesman turned entertainment agent Laurie Mansfield, Rick secured a deal with the Gemini label, where he was reunited with Mike Sheridan, but this, too, would be a short-lived affair. Next stop was Mongrel, a Birmingham rock group led by Bob Brady who wrote the band’s material and recorded their one album release, “Get Your Teeth Into This” at Air Studios in London. Two singles were released in quick succession from the album in early 1973, but it’s not one that made Polydor Records, or the band, any money. And so to Wizzard. Everyone knows the band’s hits and the on-stage antics, but maybe not so much about the high cost of maintaining such a band on the road or about the vast amount of money the band spent on studio time. 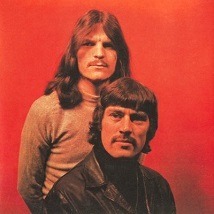 By late 1975 it was all over, but Rick and Roy Wood had one more throw of the dice, The Wizzo Band. Misunderstood by critics and ignored by radio producers the band would release an album and two singles on Warner Bros., but it remains just a foot note to Roy Wood’s story. More recently Rick worked as one half of Price And Lee with his wife Diane (the Lee of Peters and Lee) whose stage show includes tributes to the famous duo and to The Move and Wizzard.